The room was packed with companies eager to hear about the benefits of the government backed GrowthAccelerator programme, and as an active participant on the scheme, I welcomed the opportunity to share our story. 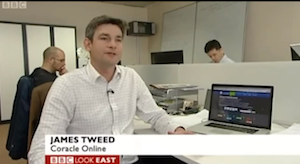 The day itself had started with a text from a friend saying, "Tweed: I've just seen you on the BBC news!" In some senses I shouldn't have been surprised. After all, BBC Look East had visited our offices at St John's the day before to do an interview. However I had been under the impression that the choice cuts would be added into a feature following the Vince Cable and Mike Lynch presentations, so it did surprise me that the morning news was carrying the story. Maybe this event was going to be slightly more newsworthy than I'd first thought! The session itself was really well run by the team at St John's. Vince Cable announced a new £100 million lending scheme for companies on the GrowthAccelerator programme via Metro Bank and to be marketed by RBS Natwest. Billy Boyle and Anita Human inspired us all with their growth stories. Listening to these shining lights was really uplifting and I felt hugely proud of the achievements of the team at Coracle that meant that we have a chance to emulate some of the local stars. After I had the chance to tell my story, Mike Lynch took to the stage and told us of how he felt quite sentimental being back in the building where it all stated for him. One $10.4 billion sale later and you'd think he might have an air of 'who needs coaching' about him. Far from it! He acknowledged that whilst coaches as such didn't really exist when he got going, mentors were an important part of his success. Unfortunately there wasn't really enough time for Q&A. One question, from Will Averdieck of PCME was put to the panel about whether the UK is as good a place to launch a business as the USA. Mike Lynch and Vince Cable were offered the chance to answer, but sadly neither of them mentioned one of the critical reasons that puts the UK in a strong position. EIS and SEIS. On a recent trip to Silicon Valley, I heard from investors how these tax incentives are the envy of our American friends. Good morning. I can see some familiar faces in the room but for those of you who have no idea who I am, let me introduce myself. My name is James Tweed and in 2006 I founded a company with my wife called Coracle Online. We develop and manage bespoke e-learning resources and systems that make it easy for people to integrate learning and development into their daily lives. By training I'm a chartered ship broker and spent many years chartering oil tankers and putting together risk management trades for ship owners and oil companies. I was lucky enough to get involved with 3 start-ups in the City, but with a young family and a desire to discover what work-life balance was I thought I'd give it a go for myself. With a focus on the market place I knew, the maritime industry, we grew nicely, although I'm not sure I ever did find the answer to the work life balance question! The company picked up a few awards and then the recession hit and it hit us hard. We found that the companies we worked with were freezing budgets and shedding staff. Inevitably our revenue fell and it was a pretty scary time. We knew we couldn't just sit and wait for things to recover by magic, we had to do something..
Our initial move was to re-use the content we had and that has led us to in excess of 7 million podcast downloads and a number 1 educational game in the App store. But despite some small wins, we recognised that we had to have more of a strategy to get to the next level. Experience had proved that we had a model of working with professional bodies that worked, but figuring out how to prioritise and to effectively plan growth was something we were struggling with. And that's where our first go with coaching started. Through a high growth programme here at St John's we were matched to a wonderful coach who helped us in a number of ways. Firstly, she made us recognise our successes. Running a small business can be a lonely experience and more often than not, it's really easy to think of successes as simply necessary parts of day to day life. But by actually acknowledging them, we had the means to start a process of working out where we needed to refine our offering. Engaging in coaching certainly helped us to successfully close an angel round of funding, to move into offices here at St John's and start to bring our contractor network in-house as full time employees. We're now signed up to the GrowthAccelerator programme and that will help us on the path of achieving our goals: which include employing more people and helping more people to achieve the success they deserve by being able to integrate their learning into their everyday life. We all know that starting and growing businesses is hard work. For some people the biggest challenge to growth is access to finance, for others the challenge is about sales and marketing. That's certainly something we're wrestling with as we move from a focus on our roots in the maritime sector to other areas. We've managed to move to insurance and veterinary so far, and we're working with our coach to put together a strategy to keep finding new market areas. But despite the obvious obstacles, I believe that the UK is actually a great place for young companies. People are amazingly generous with their time and experience, you just need to ask them for help. And lastly, following this golden summer of sport, do you remember Lord Coe's slogan, "Inspire a Generation". Well, England's most successful coach for decades, Sir Clive Woodward added another, "Inspire a generation of coaches" Can you imagine Andy Murray, Jessica Ennis or Mo Farrah without their coaches? No-one expects them to do it all themselves and society expects to help pay for them to achieve their success, so why should anyone expect growing businesses to improve their performance without help? I hope that as a country we can support one another and then bask on our collective pride as we build world beating companies. Thank you for listening and good luck with your growth.